Turbine and housing are made of durable sheet steel. The turbine is designed according to the ‘forced air guidance’ principle. This principle not only generates lots of air, but also a high pressure. 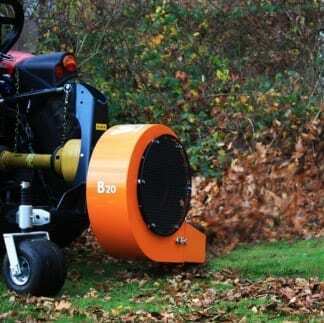 The blower can fit several PTO speeds and directions. Thence this blower can also be mounted onto the front of a tractor. Several options are available as terrain-adapting undercarriage, turnable air outlet and an air outlet for cleaning small private roads.